In September, Camso invited approximately 30 dealers and Compact Equipment for its Train-the-Trainer event in Charlotte, N.C. Over two days, dealers got to experience Camso tires and tracks both in the classroom and in the field — offering them invaluable know-how to take back to their customers. The hands-on event comes months after Camso’s new name and marketing campaign was revealed in June. Originally Camoplast Solideal, the company’s new persona blends the best of Camoplast and Solideal with a unified purpose in mind. Today, Camso designs, manufactures and distributes tires, wheels, tracks and track systems for the material handling, construction, agriculture and power sports industries. Its new slogan “Road Free” is aimed at achieving Camso’s commitments, being industrious and acting authentically in its relations with customers and suppliers. So what was there to try out? Camso outfitted five machines with its offerings for dealers (and yours truly) to take for a ride. • SD CTL Tracks — Available in two tread patterns, these best-selling tracks are known as “all-seasons tracks” and excel in a variety of conditions and climates. They offer operators good traction and ride quality with low ground disturbance. • SKS 732 Premium Off-Road Skid Steer Tires — Launched in January, these versatile and high-traction tires boast an increased tread depth from their previous model. They also feature a new impact guard sidewall design, as well as a self-cleaning tread — allowing for better traction. • SKS 793S Skid Steer Tires — Popular in severe-duty applications, this solid skid steer tire offers a versatile, non-directional lug tread pattern. It was also launched in January. • Solideal BHZ Backhoe Tires — These unique, non-directional backhoe tires are ideal for mixed or hard surfaces. They offer an improved ride quality for operators traveling at different speeds. • Over-the-Tire Tracks (OTTs) — Installed in a matter of minutes, this unique problem-solving attachment provides extra traction, stability and flotation when needed. 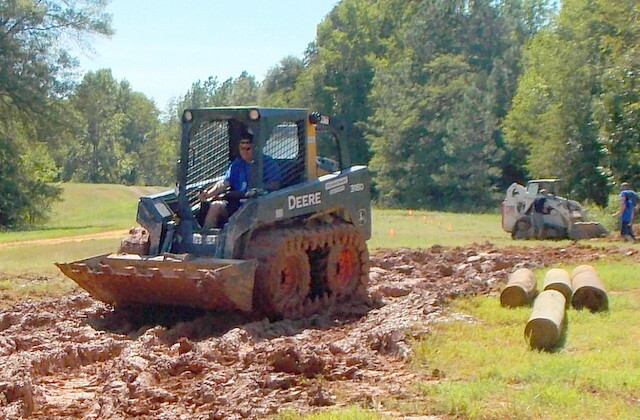 The OTTs are a cost-effective way to transform a skid steer into a track loader to tackle muddy or swampy conditions. To learn more about Camso, visit www.camso.co.